So a couple of weeks ago my brother and sister-in-law asked if I could help transform their bedroom furniture. 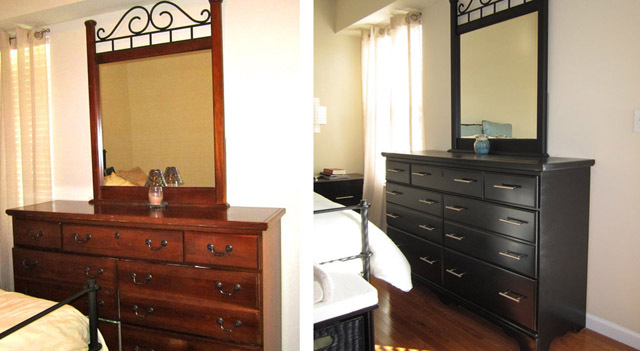 As newlyweds often do, they each brought a couple of pieces from their old bedroom sets into their new life together. 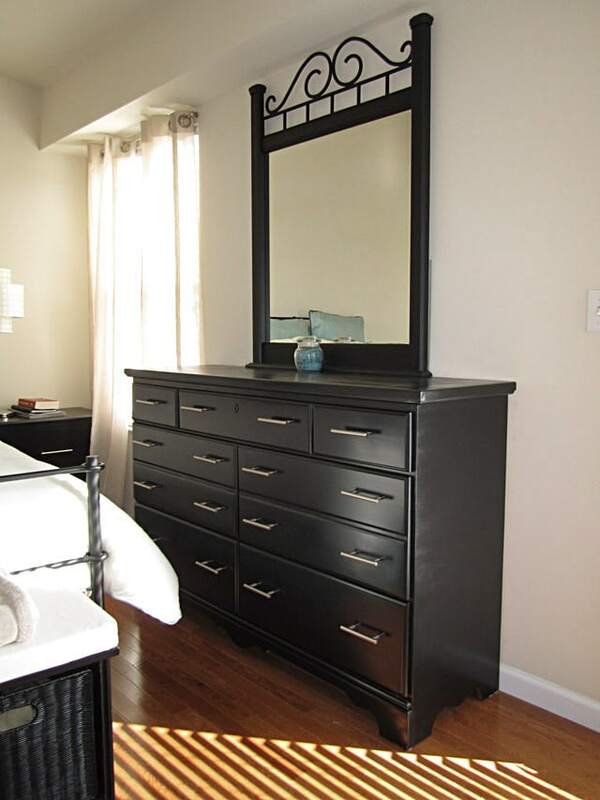 My task: to paint the dresser, mirror and one nightstand black to match their other nightstand and TV stand. Please pardon my crappy photos. I had very little natural light in this bedroom and didn’t want to create hot spots with a flash. And here’s the AFTER photos! We carried the furniture downstairs from their second story condominium and out into their garage. The first step was to wipe all the dust off and remove the hardware. My sister-in-law decided not to keep the current hardware, but still use the existing holes so I didn’t have to fill them with putty. I sanded down all of the drawers and the base of the nightstand and dresser. 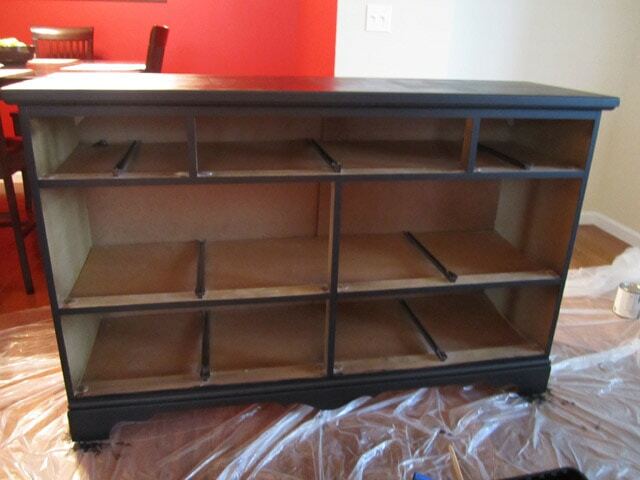 Once the sanding was complete, I used Rustoleum’s flat black spray paint to cover the drawers. To make sure I didn’t get any paint inside the, I just held up a piece of cardboard against the edges while I spray painted. 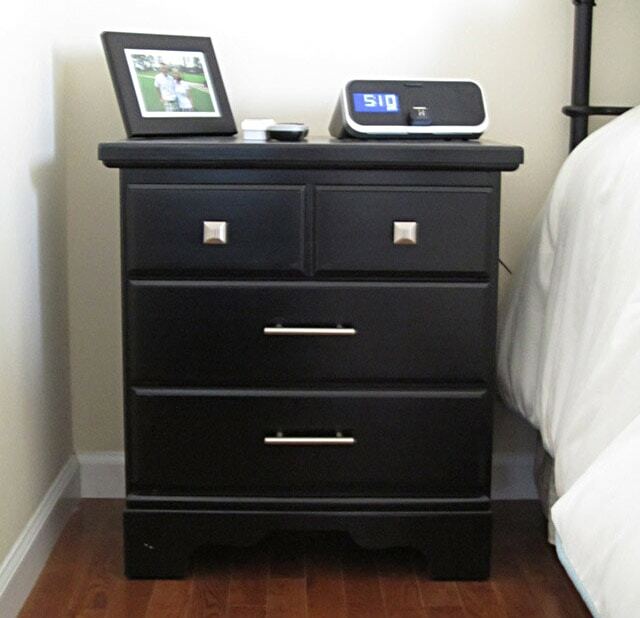 For the base of nightstand and dresser, I used Valspar’s flat black latex paint along with a small roller brush for the tops and sides and a smaller hand brush to get the detailing. And here’s the painted nightstand! OK, onto the large dresser! Now we couldn’t move this piece downstairs to paint cause it’s just too heavy… so, I had to set up shop in their dining room! 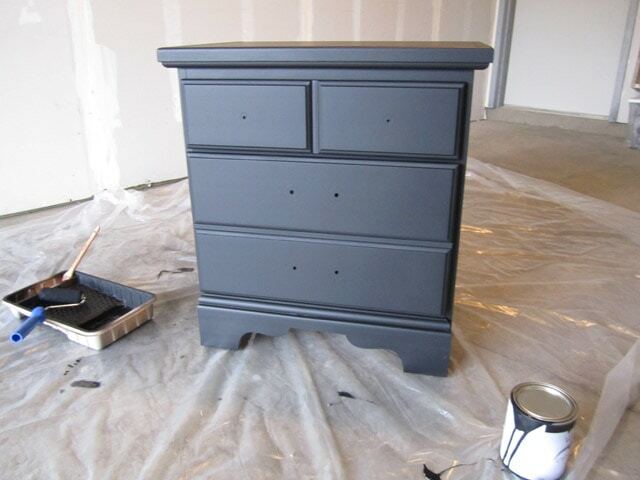 I used the same flat black Valspar latex paint to coat the base of the dresser. 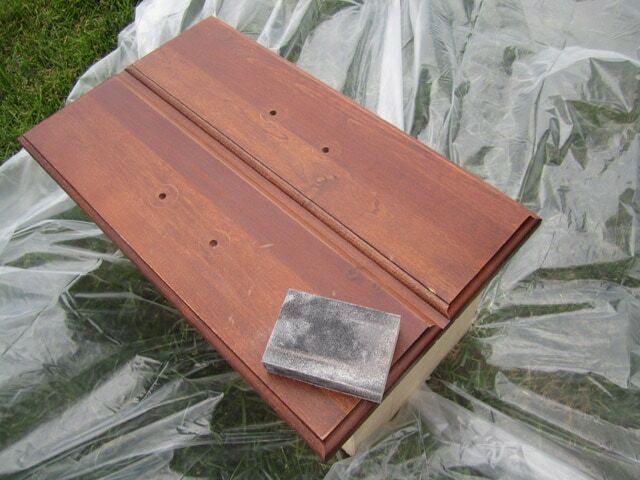 Once the paint was dry, I used Minwax polyurethane to seal the dresser and nightstand. 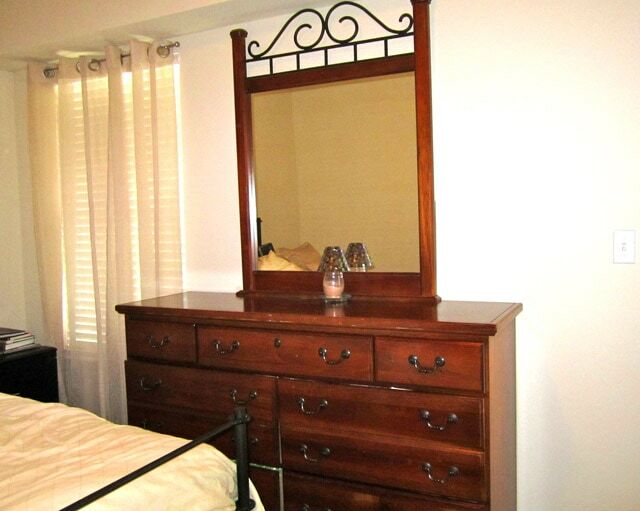 The dresser also had a matching mirror that I had to paint. I taped up the inside with painter’s blue tape to protect the mirror. OK, ready for some after shots? Here’s the before & after side by side! 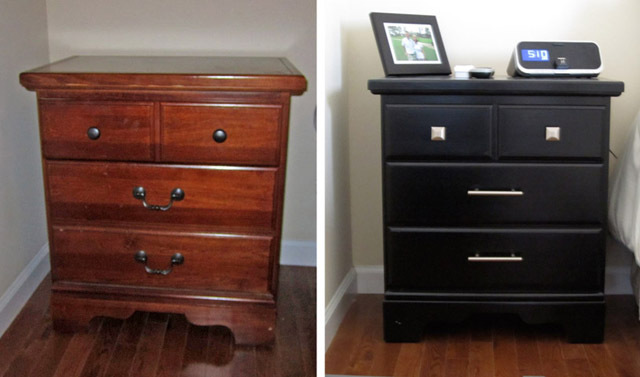 Isn’t it amazing how paint and some new hardware can change a piece of furniture from traditional to modern? 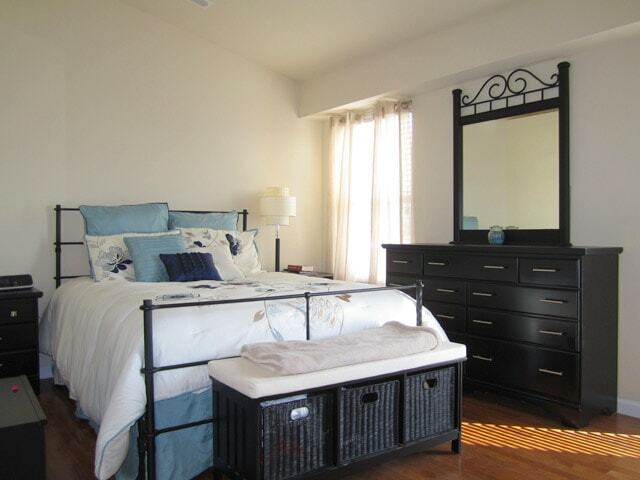 See the black nightstand in the left of the photo? Yep, that’s the black nightstand they already owned! My sister-in-law matched the new hardware perfectly! They still need to get their walls painted and some wall hangings, but a HUGE improvement thus far! 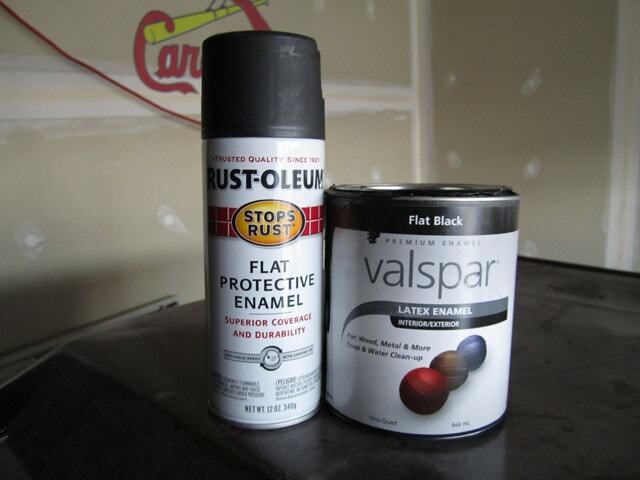 Total costs: $9 for the Valspar flat black paint, $8 for the Rustoleum black spray paint, $10 for polyurethane, and a couple bucks for drop cloths, sandpaper blocks, paint trays, brushes, rollers, etc. I would estimate the total costs being around $50 without the new hardware. 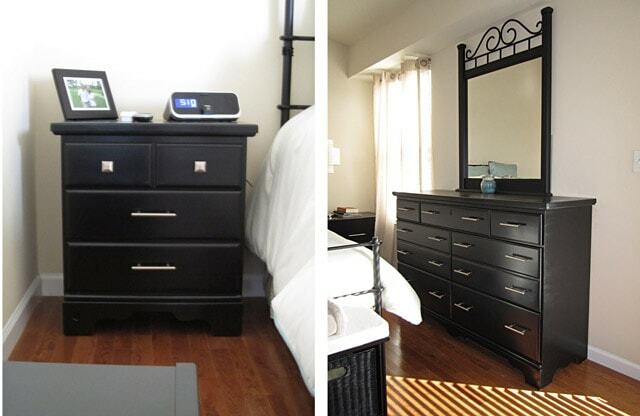 Not too shabby for a completely transformed bedroom set! Black was a great choice to compliment what was already there! Great face lift! 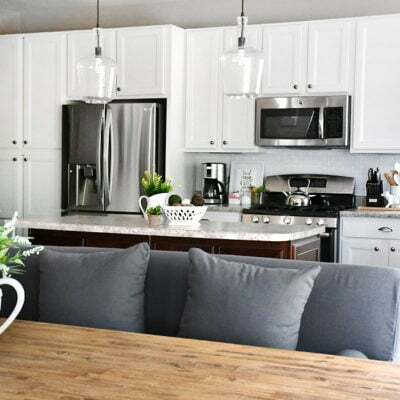 The furniture looks so different that it must feel like a whole new room! Well done! I found you at the newbie party and am a new follower! What an awesome transformation. Looks so much more modern and cool. I am your latest follower. I found you via Debbie’s party. I hope you stop by and say hi. Also, I host a link party that opens each Tuesday night at 8pm EST. Would love for you to join in the fun. Thank you!! I just linked up to your blog. I also added you to my Link Parties page! Thanks for hosting. that’s a perfect match, and love those knobs. what a great transformation! 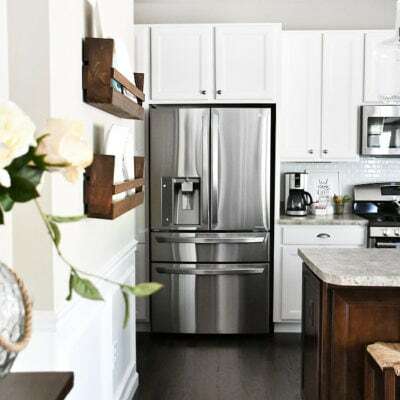 I love it especially the hardware, doesn’t evenlook like the same furniture! Great job on it! wow! what a difference!!!! they look so modern- the hardware looks fabulous! That’s fantastic! 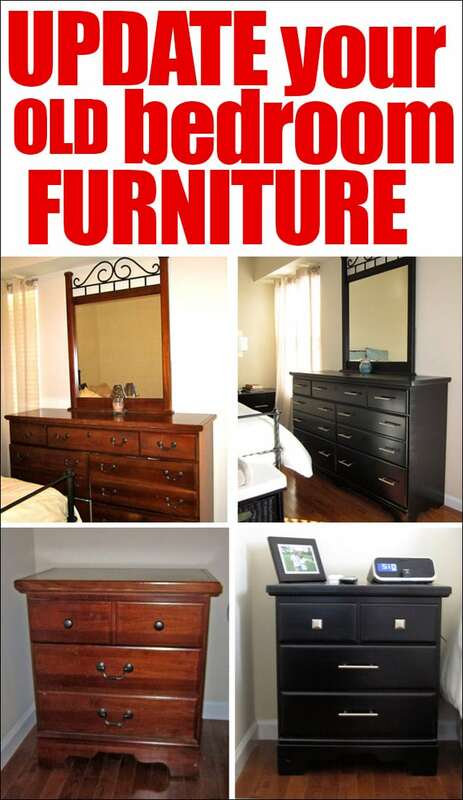 I’ve been eyeing our bedroom furniture for a while now.. it is in desperate need of a makeover too. Love how a coat or two of paint can make such a huge difference! Wooza! That is great. Over from NTT. I know they are tickled pink. I think that furniture looks so much better painted black. 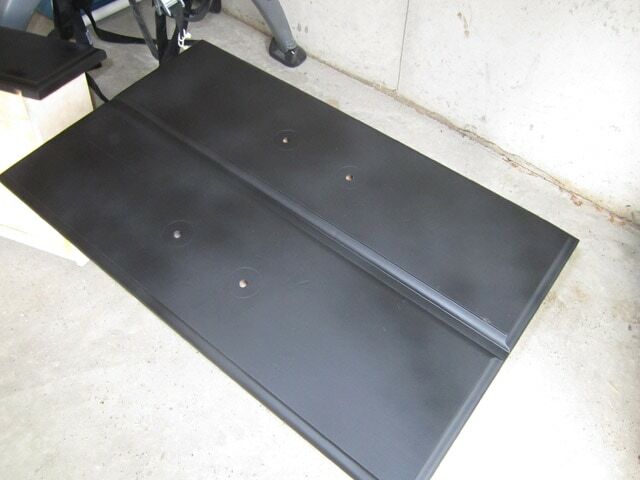 I also used black spray paint to refinish a few of my pieces of furniture. That is pretty darn fantastic. You would nEVER know that was the same furniture. This was a great transformation. It is amazing what a little paint can do. The new hardware was just the right touch. Thanks for sharing. THis looks great! What a transformation! What a great transformation. I love how you were able to match all the furniture and modernize it. I would love to have you join my link party that will be up this evening. Not too shabby is the understatement of the year….AWESOME transformation!! Bravo! WOW! Such a great illustration of how hardware can change a piece. Beautiful work! What a stunning transformation! 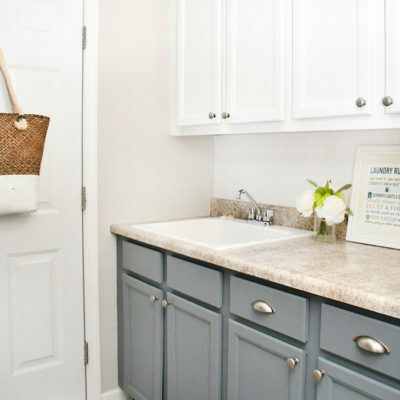 Love the square knobs too! Get out of here! I am beyond envious of people who can transform furniture like that! Wow! Paint is a wonderful thing. Great job! I came by to say thanks for joing the Bunny Hop party this week, and make sure that I am following you. xoxo Bunny Jean @ BunnyJean’s Decor and More! oh wow! I’m totally loving the new hardware! WOW. Love the black. Love the hardware. You did an outrageous job! Wow! It looks amazing! 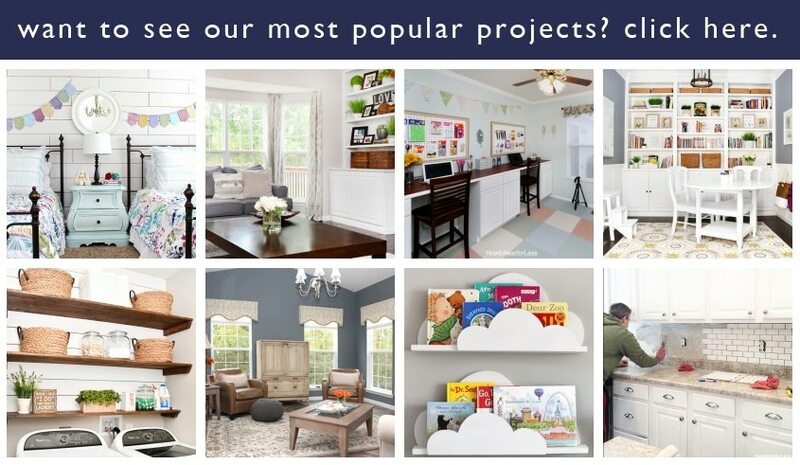 You did an awesome job on the paint, and you picked out the perfect hardware for it! Thanks for sharing! I love your re-do. 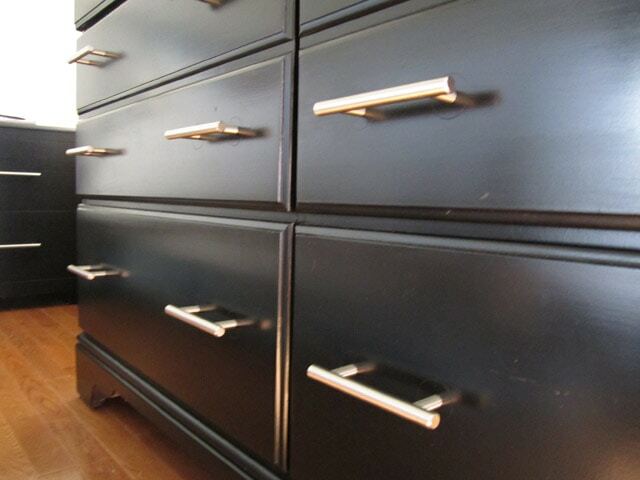 I re-did and chest odf drawers and painted it black too! I think black instantly updates anything! Nice work! Your transformation is impressive! I’m sure that your brother & sister-in-law will be using your services for more projects down the road. Hey!!! I love it !!! I have a similar situation and I hope I can do this as beautifully as you did it. My only concern is there’s no way I can move the big dresser downstairs also my king size bed, so how do i sand it in the room itself. Any trick I can use to re-do the bedroom set without having to move it? Any special technique for spray painting. I know it is harder than it seems it would be. Awesome redo! 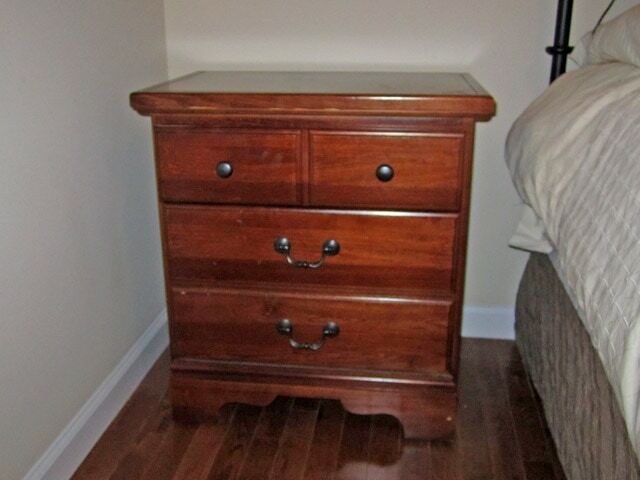 Is there a particular reason why you used spray paint on the drawers and regular paint on everything else though? Thanks! I’m so impressed with this transformation. You’re a genius! What sheen poly did you use? Also flat, like the paint? I used a satin poly and flat sheen paint. I find it best to work with flat paint since it doesn’t leave streaks. The poly in a satin is much easier to work with! Wich kind of minwax polyurethane did you used for it..? Satin or semigloss..? Thanks for all the tips here… I have some nice oak furniture from the 80’s that I would love to update. Now that its 3 years later, I’m curious as to how the finish held up. Were there any problems with peeling or scratching? Furniture has held up wonderfully! Even through two moves. 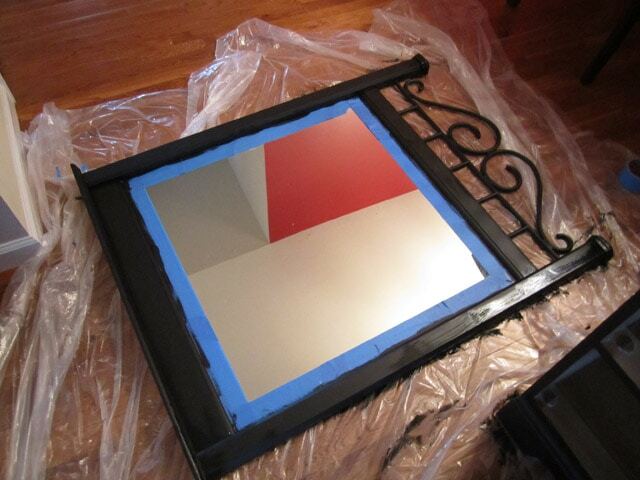 Question…why did you use spray paint only on the nightstand table? Super smooth finish with no brush strokes! Wondering why u used the Rustoleum on the drawers in the beginning. And why it wasn’t mentioned on other pieces. Beautiful. I wanted super smooth coverage for the drawers with no chance for brush strokes (although looking back now I could have used Floetrol or something similar to condition the paint). So really no need to spray paint, it was just a personal preference at the time! Wow, amazing job. Now maybe this post will convince my hubby that we can do that with our furniture! He always tells me “no” when it comes to painting furniture.